With this week’s Gluten Free Menu Swap theme of light and easy for summer, I thought I would post this recipe. We have fallen in love with napa cabbage chopped salads and slaws. This one was inspired by a couple of the napa cabbage recipes over at Kalyn’s Kitchen where she blogs about South Beach Diet recipes. Many, if not most, of her recipes are naturally gluten free or easily modified with minimal substitutions. But that doesn’t mean that they are missing any flavor! We’ve just loved everything we’ve made from Kalyn’s blog. (This is starting to sound like an Adopt a Gluten Free Blogger post…hmmm.) Thanks for the inspiration Kalyn! This makes a lot so feel free to make only half but it is a great dish to take to a potluck or picnic. Toss together all of the salad ingredients, except the sesame seeds, in the largest bowl you have. In a mason jar with a lid, mix together all of the dressing ingredients and give it a good shake. Taste and add more salt if needed. Or ginger. Or sweetener. Or whatever. Start small and stir some of the dressing into the salad. Add more if you would like. Adjust it to your preferences. Top with sesame seeds. If you won’t be eating this all at one time, I would suggest keeping the edamame in a separate bowl and adding it when just before eating it. Same with the sesame seeds. We were able to eat this salad for an entire week because I kept the salad and dressing ingredients separate until we were ready to eat it. 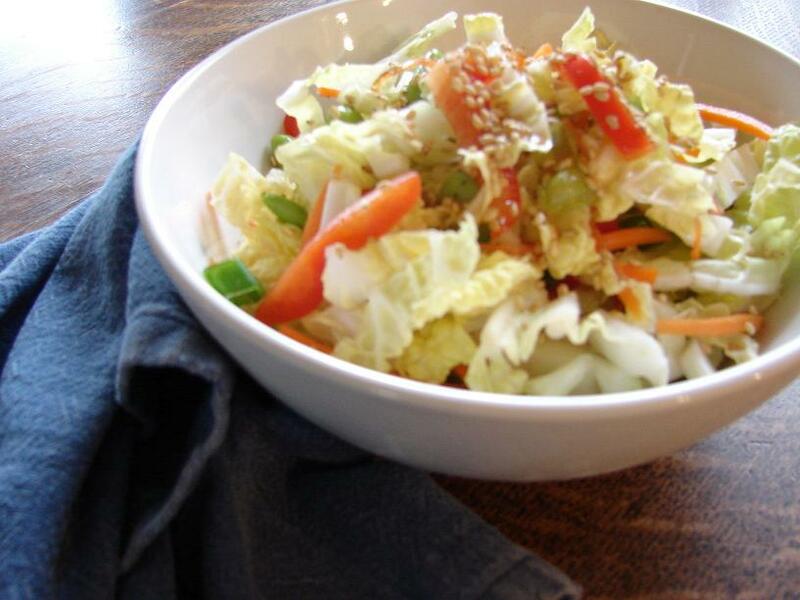 Do you have a favorite napa cabbage recipe? This recipe was submitted to Slightly Indulgent Tuesdays over at Simply Sugar and Gluten Free. As well, this recipe was cross-posted over at Gluten Free Easily’s Virtual Support Group.